Winner Area girls cross country team placed second at the SESD conference cross country meet Oct. 1. Sidda Schuyler led the varsity girls as she took second. 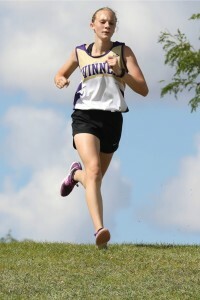 She was followed by Saige Schuyler, 8th; Aryn Meiners, 13th; Meagan Blare, 15th; Melanie Brozik, 21st; Jaclyn Laprath, 23rd. In the varsity boys race, Kade Watson took third followed by Wyatt Turnquist, 16th; Joseph Laprath, 20th. In the junior varsity girls race, Madison Thieman was 6th; Katherine Jankauskas, 12th; Gabby Kocer, 14th and Trinity Vrbka, 16th. Winner Area girls cross country team took first place at the Ethan/Parkston Invitational on Oct. 4. Sidda Schuyler took first place. Also placing for the Lady Warriors were: Saige Schuyler, 6th; Meagan Blare, 7th; Aryn Meiners, 8th; Melanie Brozik, 9th; Jaclyn Laprath, 14th. Kade Watson led the Winner Area boys as he took second place. Joseph Laprath placed 20th. In the junior varsity girls race, Madison Thieman placed 4th, Gabby Kocer, 9th, Katherine Jankauskas, 10th and Trinity Vrbka, 11th. Wyatt Turnquist won first place in the junior varsity boys race. The regional will be Oct. 11 in Chamberlain.